A newly acquired environmental impact report has provided fascinating insights into Blue Origin’s plans to become a major player on the Space Coast. With a massive facility under construction at KSC’s Exploration Park, the company plans to utilize two Cape Canaveral launch complex’s to test rocket engines, integrate launch vehicles, and conduct up to 12 launches per year of its heavy-lift class orbital vehicles. 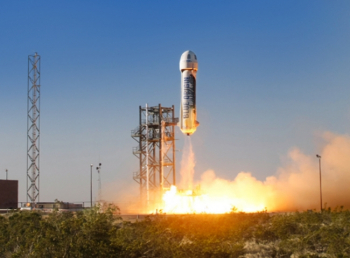 Blue Origin was founded by Amazon billionaire Jeff Bezos and initially tagged as a space tourism project. However, the company is now upping its pace, following the path of its motto ‘Gradatim Ferociter’ – step by step, ferociously. While its test flights – and landings – of the suborbital New Shepard rocket have been greatly impressive, Blue Origin is now pushing towards a slice of the orbital market via its New Glenn rocket. With New Shepard testing the BE-3 engine, it’s the BE-4 engine that will accelerate the company forward even more ferociously. The new engine – set for a test fire in the very near future – even won the attention of space industry powerhouse United Launch Alliance (ULA), as it eyes an American made engine for its Vulcan rocket. Blue Origin’s New Glenn will be the primary user of the BE-4 engine, launching from Cape Canaveral’s LC-36. However, the company’s presence on the Space Coast will be far more than just at the historic launch pad. 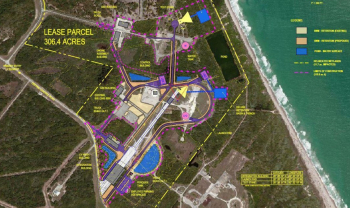 With a huge facility already rising out of the ground at the Kennedy Space Center’s Exploration Park, hardware will make the trip to what will be a 300-acre parcel of land that formerly housed both LC-36 and LC-11. 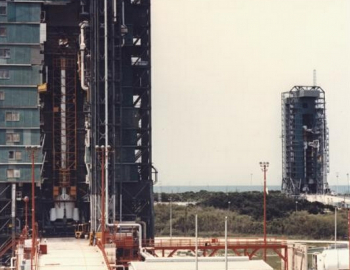 Throughout nearly 43 years of operation, LC-36 – which comprised of two pads (A and B) launched a combination of commercial and government missions, including those for the USAF and NASA. Since NASA’s first launch of an Atlas/Centaur rocket in 1962, LC-36 has hosted 145 rocket launches from its two pads (68 from LC-36A and 77 from LC-36B). The last launch from LC-36A was an Atlas IIAS in 2004, and the last launch from LC-36B was an Atlas IIIB in 2005. After LC-36 was deactivated in 2006 and much of the infrastructure was demolished in 2006 and 2007, the USAF granted a license to Space Florida in 2009 for the re-development of LC-36 for use as a launch complex for generic launch vehicles (GLV). In 2010, the USAF 45th Space Wing issued a Real Property License to Space Florida for the complex, allowing for a deal to be struck with Blue Origin with a sub-license agreement on May 12, 2016. Space Florida has played a pivotal role in revitalizing the Space Coast, with numerous deals, including the SpaceX’s deal to lease Pad 39A. 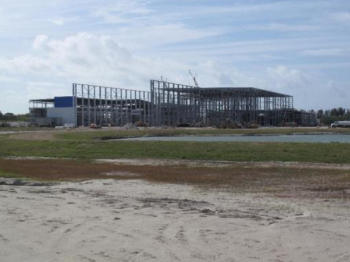 While LC-36 will be the site of New Glenn launches, a lengthy Environmental Assessment report shows Blue Origin will create another facility at the adjacent LC-11. From the time of the first launch on July 19, 1958, of an Atlas B to the last launch on April 1, 1964, of an Atlas F, thirty-two rockets were launched. The site was deactivated in 1967, with the pad and service tower structures dismantled. In 2013, the blockhouse was demolished and the site is no longer being maintained. 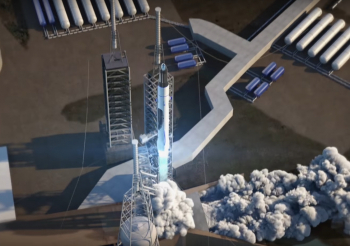 That will change via Blue Origin’s plans, which include a BE-4 engine test stand at LC-11. 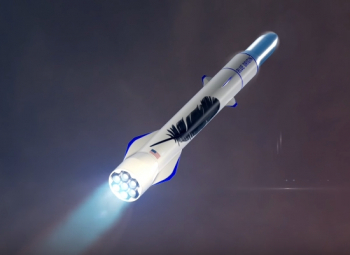 As such, a path of operation for Blue Origin will involve the manufacturing of the large elements, such as first stages, second stages, payload fairings, etc. occurring at the new facility located at Exploration Park (Phase 2). It is anticipated that primary commercial payload processing would occur at an off-site operations support area. Once primary payload processing is complete, the payload will be trucked to the Orbital Launch Site (OLS). Optionally, payloads would be fueled at the integration facility. For the rocket hardware leaving the Exploration Park facility, it will go on road trip to the OLS, as overviewed in the Environmental Assessment report. 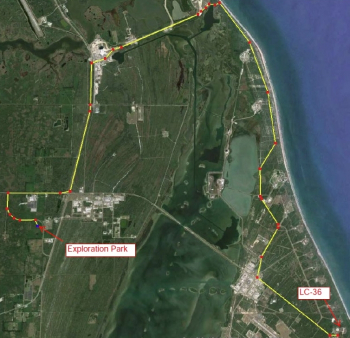 The path takes the hardware north, then east and down the coastline into LC-36. “The major elements of the OLS at CCAFS are the launch pad, integration facility, engine test stand, and the systems to recover and refurbish reusable space systems such as the first stage. “Once elements have been manufactured at the Exploration Park manufacturing facility, they would be transported by road to the integration facility at LC-36. “The first and second stages, and a possible third stage, would then be mated together and integrated onto the transporter erector system. When New Glenn was first introduced, the two-stage variant – with its seven BE-4 engines consuming liquefied natural gas and liquid oxygen – was portrayed as 270 feet tall, with a second stage powered by a single vacuum-optimized BE-4 engine (the BE-4U). A 3-stage New Glenn was shown to be 313 feet tall, with a single vacuum-optimized BE-3 engine, burning liquid hydrogen and liquid oxygen, powering the third stage. Interestingly, the report notes the three-stage vehicle will be “up to 350 ft (106.68 m) tall, with the thrust of the vehicle reaching approximately, 4.5 million lbf (2 MN). 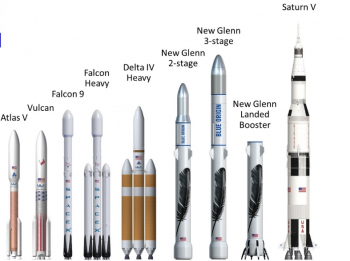 The report also adds that the launch rate anticipated for New Glenn will eventually reach 12 launches per year. 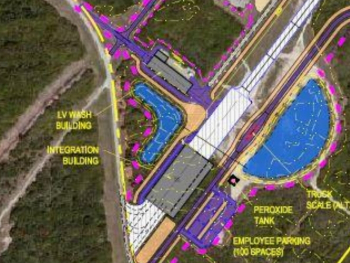 The eventual makeup of the Blue Origin OLS complex will see it spread over existing LC-11 and LC-36, with the launch pad co-located on the former LC-36A area and the engine test stand on the former LC-11 area. 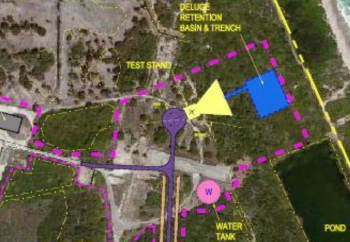 The company will build a deluge basin for the launch pad, located east of the pad, an integration facility, refurbishment building, and GSE (Ground Support Equipment) building will be constructed to support launch operations. Approximately 100 parking spaces will also be constructed for the facility workforce. Another GSE building will be constructed to support engine testing operations. LOX, and LNG, and LH2 storage tanks will be constructed in the vicinity of the launch pad for the purpose of supporting both launch vehicle fueling, as well as engine testing. A water tank will also be constructed between the launch pad and the engine test stand for water sound suppression and firefighting water supply. Blue Origin – like SpaceX – has reusability as a major element of its business case, with New Shepard proving to be an able pathfinder for landing the booster after launch. 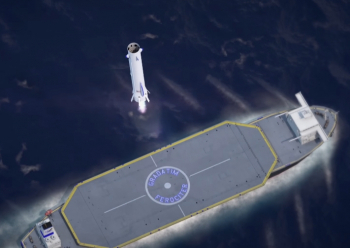 New Glenn will also return the booster home for reuse, with the latest overview video showing the first stage landing on a ship in the Atlantic. The report notes the recovery area is expected to defined as an ellipse centered on approximately latitude 29° 42’ 17.79” N and 71° 30′ 53.01″ W with a length and width of approximately 630 miles (1013 km) and 440 miles (708 km) respectively. The booster will then be returned back to Florida, sailing into Port Canaveral, with the environmental impact report showing the path it will then take back to LC-36 for refurbishment – including a wash down – while also outlining how Blue Origin will process the returned stages. “The refurbishment building will be constructed at the entrance to the current LC-36 complex. “After the recoverable first stage is retrieved and returned to the launch site from its offshore landing area, it must be washed to remove salt spray and possible contaminants associated with launch and re-entry. The stage – as with new stages – will then head to the integration facility at LC-36, located approximately 2,000 feet from the launch pad. This building will have an area of approximately 150,000 sq. ft. (13,935 sq. m.) with a length of 500 ft. (152.4 m.), a width of 300 ft. It may also contain office space and payload fueling operations may also be performed in the integration facility. The single engine test stand at LC-11 will be used for engine acceptance testing of the BE-4 engine. “This stand could be designed with a vertical testing configuration for testing the BE-4 engine,” added the report. “The BE-4 will be indirectly fueled during testing through use of remote LNG and LOX tanks located in the vicinity of the test stand. The report adds acceptance testing requires a variety of engine test run durations with a maximum total run duration of approximately 500 seconds. The total duration of all engine testing would be approximately 30 minutes per month based on approximately nine test events per month. The report also notes New Glenn flows will likely include static fire tests of the rocket on LC-36. Additional points made in the document includes work that will be undertaken on the roadways, which includes side by side roadways and enough room for at least two first stage boosters side by side in the integration facility. All new road-ways will be constructed between 6 inches and 12 inches higher than existing roadways “which are some of the highest in the area”, based on “factored global climate change and water level rise” forecasting. With Blue Origin set to make Cape Canaveral the home of its OLS, the report also noted the Space Coast had to compete with several rival sites within the continental United States, including Camden County Georgia, Hyde County North Carolina and Virginia’s Wallops Island. New Glenn may debut out of Cape Canaveral as soon as 2020. (Images via USAF, Blue Origin and L2).